China is projected to surpass the US as the world’s largest economy by 2028, and a new study this month from the McKinsey Global Institute (MGI) paints a vivid picture of just how much Chinese consumers will factor in the global economy in the next 15 years. MGI projects that global urban consumption will grow by US$23 trillion between 2015 and 2030 (a 3.6% compound annual growth rate). And Urban World: The Global Consumers to Watch highlights that there are nine groups of urban consumers worldwide that are projected to drive urban consumption growth from 2015 to 2030. The importance of these key consumer groups arises in part from some related macro trends in the global economy. Until the start of this century, increases in global consumption were largely driven by population growth. But population growth is slowing now around the world and, looking ahead through 2030, increasing populations will only account for about 25% of projected global consumption growth. The rest will come from higher levels of per capita consumption, especially among the key consumer cohorts noted above. In other words, over the next decade or two, real growth in consumer spending is going to increasingly come from each individual spending more. China’s urban working-age group (that is, those aged 15 to 59 years) currently numbers 521 million, but MGI projects that the cohort will add another 100 million people to reach 628 million by 2030 (an increase of 20% in just 15 years). 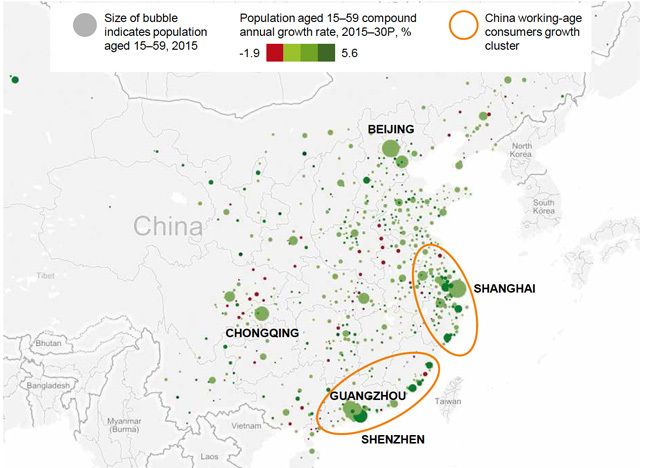 Nearly 19 million of China’s working-age consumers live in Shanghai. Another 17 million are in Beijing. But, as the following illustration reflects, the greater proportions of working-age Chinese are to be found in the major manufacturing centres of the south, such as Dongguan, Foshan, Guangzhou, and Shenzhen. And younger Chinese – raised under the country’s one-child policy – have also benefitted from the expansion of consumer spending across the working-age cohort. Per capita consumption up to the age of 29 is higher in China than in any other country, reflecting in part that parents with a single child are able to devote more resources to that one son or daughter. Even so, a lot of that spending power is concentrated on education. On average, education spending makes up nearly half of the per capita consumption of a 20-year-old in China, as opposed to less than 25% in the US. To be clear, the further forecasted increases in educational spending through 2030 include all manner of education services, including education technology, school fees within China, and study abroad. But the overarching trends that we see here, particularly income growth and a further expansion of the middle class, bode well for the country’s continued prominence as a key international education market. This entry was posted in Asia, China, Most Popular, Regions and tagged student recruitment, universities with international students, international students, college admissions, student mobility.